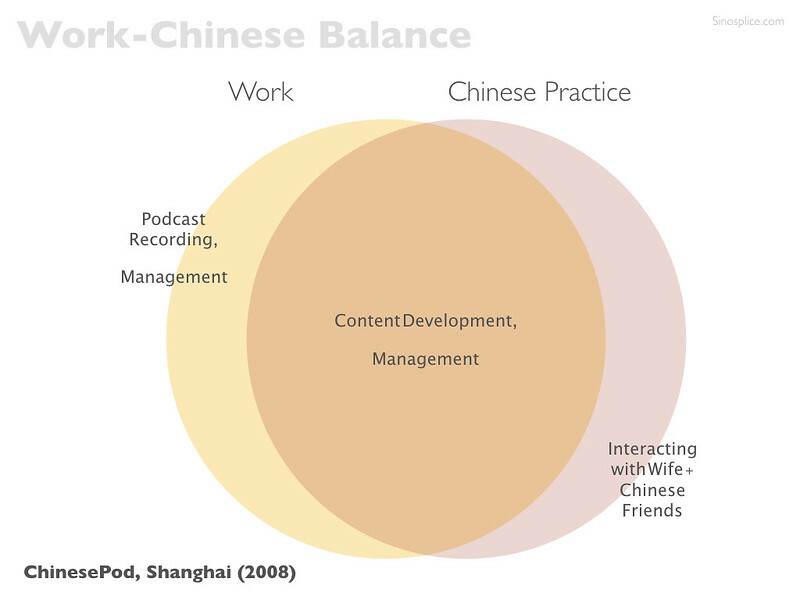 You hear a lot about the “work-life balance,” and what I want to discuss here is similar, but related to Chinese learning, of course. 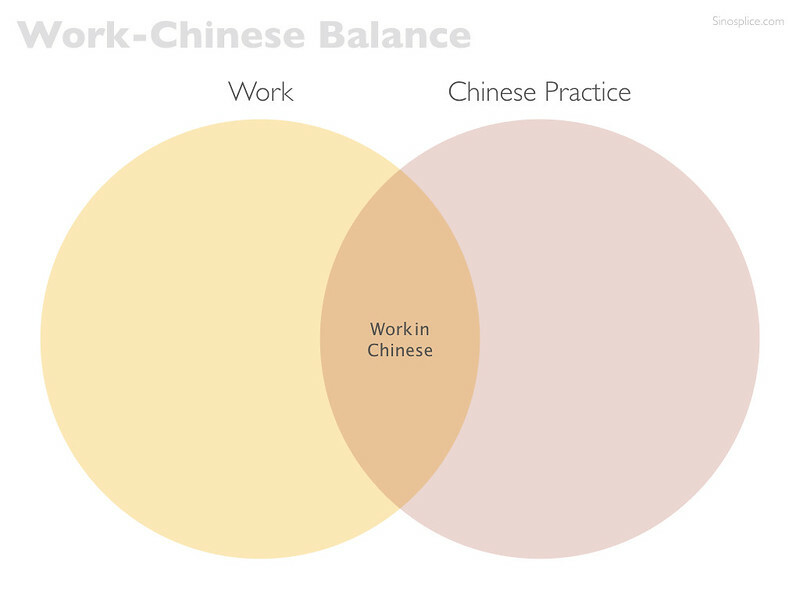 I’m drawing upon my own experience, as well as the experience of hundreds of clients at AllSet Learning, most of whom are learning Chinese for work-related reasons. 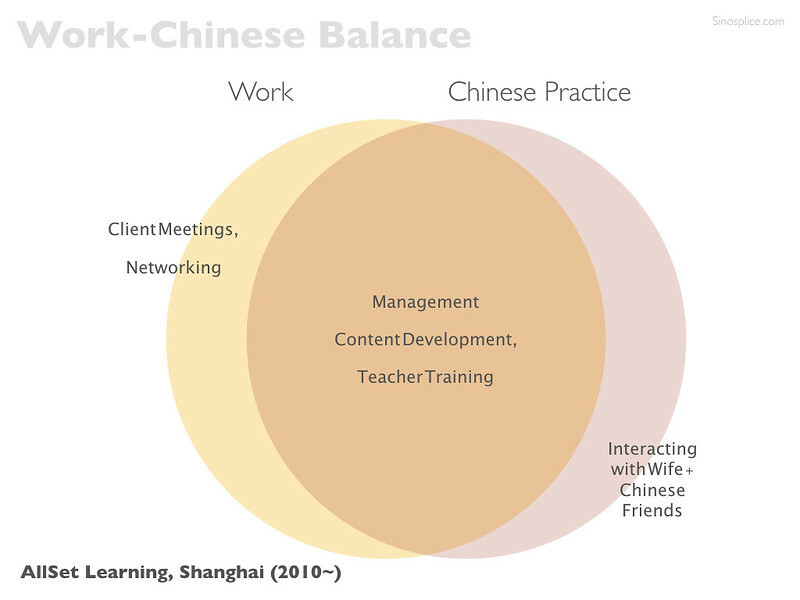 Since most of my clients live and work in China, we’re talking about a natural second language learning situation (learning while immersed in the target language environment). Theoretically, at least, they could be using Chinese for their work, in some capacity. 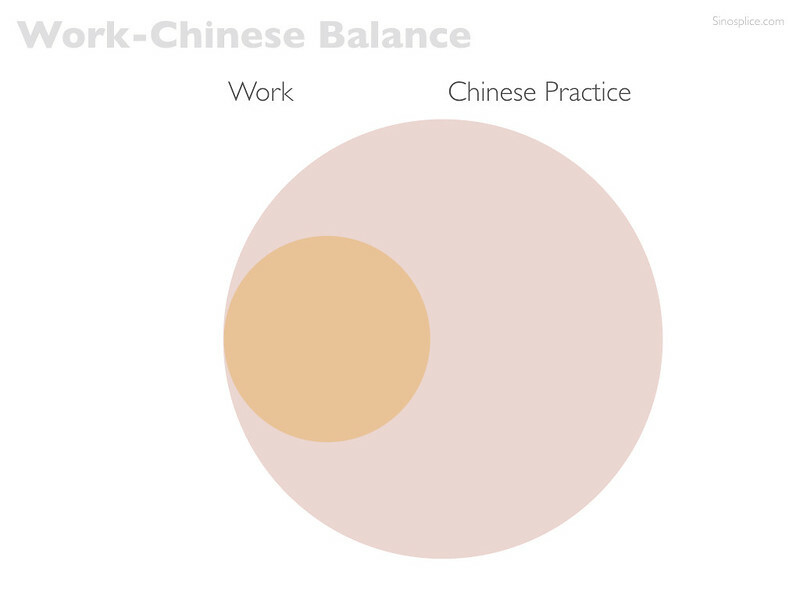 Hence the term “work-Chinese balance.” If you live and work in China, how much do you use Chinese on the job? The answer could range from not using a word of Chinese ever (this is quite common for expat executives working for multinational corporations in Shanghai, for example) to using Chinese all day every day as part of the job. It should come as no surprise that regularly using Chinese on the job results in much faster learning. Combine that with a practical, customized course of study focused on their work content, and progress can be extremely rapid. This is what I strive to help each of my clients achieve. Can I have some Venn diagrams with that? Time to Venn it up! Before getting into my own personal situation, let me just lay out some possible scenarios. When I first arrived in China I taught English in Hangzhou. I didn’t use any Chinese for my job, but I actually didn’t work a lot of hours every week, so I spent a ton of time studying and practicing Chinese in my free time. After moving to Shanghai in 2004 I worked for a company called Melody. I was building on my English teaching experience, but starting to work Chinese into my job. This was an exciting time, and I made full use of the opportunities. My Chinese improved a lot, and I even had to speak Chinese on stage, in front of hundreds of teachers, for pronunciation training. A little pressure can be good! I had to work hard to get into a Chinese grad school program in applied linguistics, and once I did it, I switched to a part-time job doing translation. 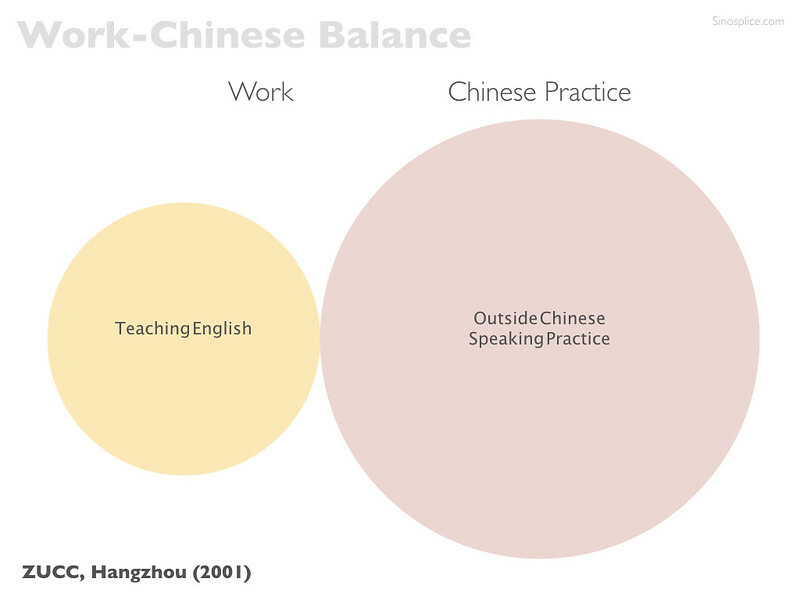 This was good reading comprehension practice for me, but since I was producing written English and not speaking Chinese, I don’t consider it full “work immersion,” and for the purposes of this article I’m more concerned with speaking. You could also say that my grad school coursework was my full-time “job” at the time (I was on a student visa), and for that, I was fully immersed in Chinese. I got more listening and reading practice than anything, but it was still beneficial to my development, especially in sophisticating my vocabulary and upgrading my academic reading comprehension to adult-level. Next came my 7+ year stint at ChinesePod. This was a lot of fun, and although I used a fair amount of English to communicate with upper management and other non-Chinese staff, I was also immersed in Chinese for most of my work. I got to geek out discussing linguistic issues on a regular basis. I was able to really flesh out my knowledge of Chinese, making it much more detailed. As a non-native speaker in the industry of teaching Chinese, the constant and long-term incrementing of my metalinguistic knowledge of Mandarin was super useful. I also got to have fun directing the creation of tons of lessons, which had its own learning benefits (frequently cultural). Finally, I arrive at my current job at AllSet Learning. As a consultant, I’m in frequent contact with my clients, including face to face meetings, and most of that is in English. I also manage all the development of resources like the Chinese Grammar Wiki in English. 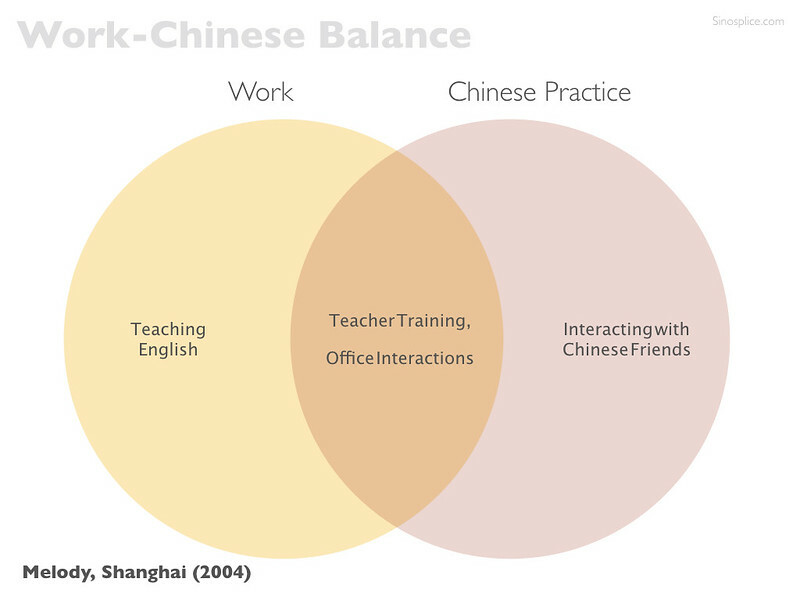 But a ton of my work is spent working with Chinese teachers and other staff in Chinese. This also includes tasks like teacher training. 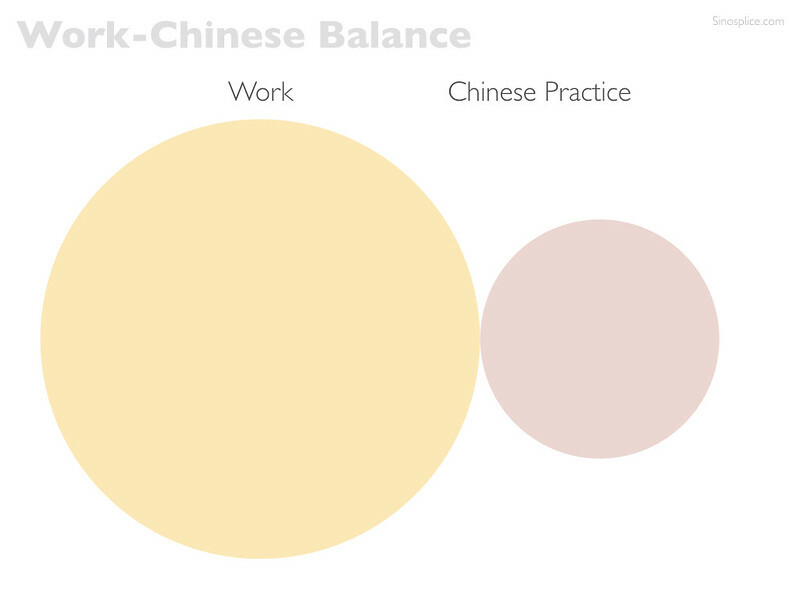 If you’re living and working in China, definitely give some thought to your own work-Chinese balance. It could make all the difference. 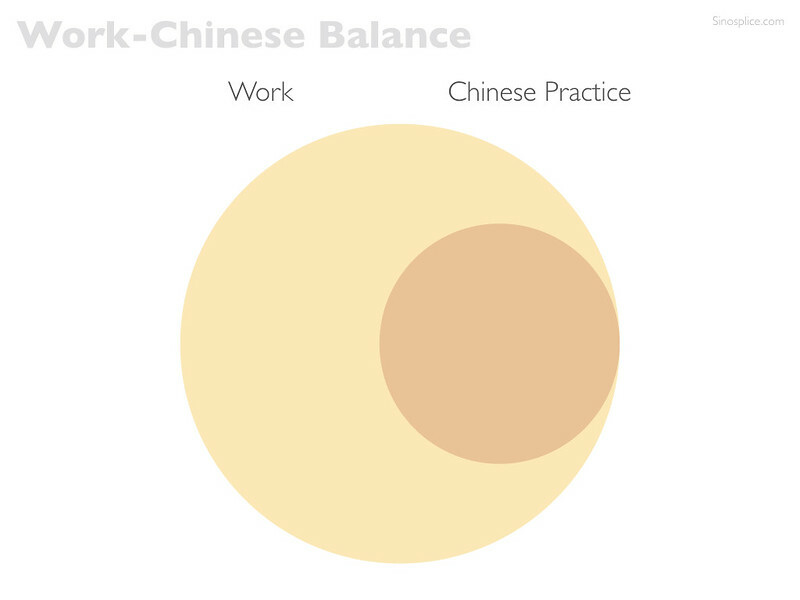 For a related post on mixing “practice” (often work) and “study,” see also: How I Learned Chinese (part 4). Recently I read a memoir by a South Sudanese who immigrated to Australia. He was a former boy soldier and he had horrific experiences. In coming to Australia, he threw himself into learning English. He spent a lot of time playing soccer, saying the game was the same all around the world. Eventually he gained an accounting qualification. The job was too challenging for him and he quit to work in a chicken factory. He said, “Although the smell was bad, I preferred it to working as an accountant.” Perhaps during this time his English foundation settled to the point where he could learn new topics through English. One can only wonder what Venn diagram this would fit into. Afterwards, he studied law, and he related in his memoir how difficult it was to comprehend the archaic language of the law. FLUENCY – From my experience with about 3-4 friends, they became very fluent “native-like” in English (all had studied many years of English and were functional in English at a college level, but did not “sound” native) only after working in the U.S. for about 4+ years and using mostly English at work. One was a localizer, so she continued to use her native language quite a bit for the work. I mention this because it is in contrast to many others I have known that as adults immigrated to the U.S., but did not need to work predominantly in English, even though in the U.S. They hit a plateau and “frozen” state in their English development and never got to sounding native-like. So I don’t really believe in the concept that adults fossilize, although it’s really easier because of the environment. I assume this would similarly apply to learning Chinese in China. For myself, as I don’t need to “work” in Chinese, although I’m in China, I have somewhat plateaued, and only make gains thru my conversations with others socially in Chinese. I think work provides motivation, a need, opportunity, repetition, exposure, etc., to make big gains. I do, however, feel that I continue to make gains, quite naturally by being immersed here…and paying attention.